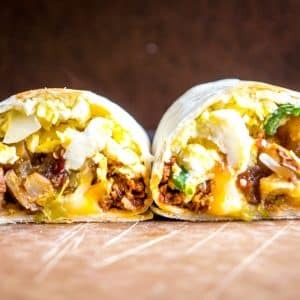 It would be easy to give all the credit to the homemade chorizo in these epic breakfast burritos. And it’s true, having access to a batch of authentic chorizo does amp them up a notch, but there’s a hidden reason that seems to make people gobble up these burritos. Hint: think green. 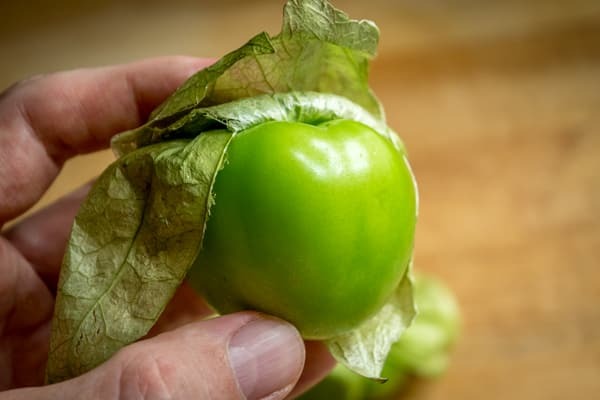 The subtle tartness of roasted tomatillos seems to pair effortlessly with eggs, so if you’ve never used tomatillo-based salsas in your breakfast burritos before then the time has come! A standard Salsa Verde is a great option for these burritos and definitely worth trying, but today we are using a Tomatillo-Chipotle Salsa to add an additional hint of smokiness to these otherworldly burritos. That’s the Tomatillo-Chipotle Salsa. It’s a ridiculously easy salsa to make and you’ll be surprised how much reward you get for so little effort. Basically, you are roasting tomatillos and then blending them with garlic and chipotles in adobo. Easy right? If you don’t have chipotles on hand you can always make a traditional Salsa Verde. I usually start with the potatoes because they tend to take the longest. Let the potatoes bake at 400F and give them a toss after 15 minutes. They’ll need 20-25 minutes total depending on your oven. You can easily get four burritos out of a half pound of chorizo so that’s what we are starting with here. 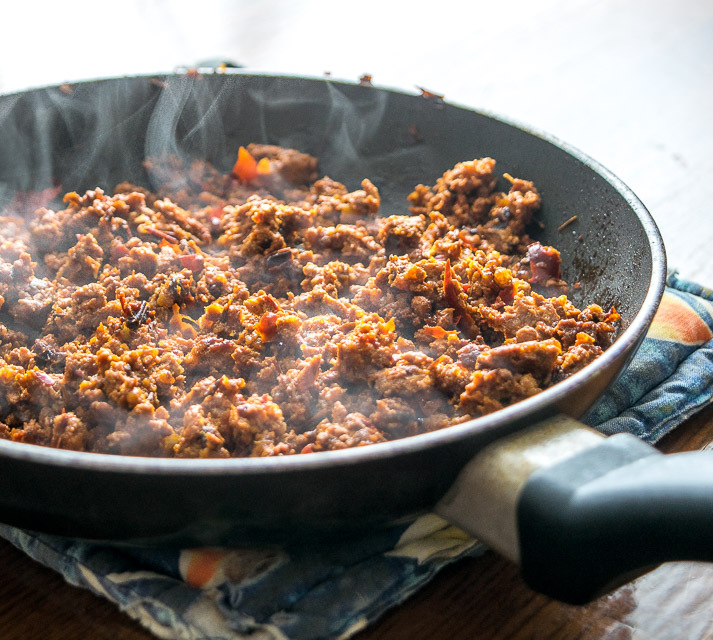 This is a batch of homemade chorizo sauteed for 3-5 minutes on each side. Set aside when done. Next, lightly saute 1/4 onion and a single jalapeno, both finely chopped. 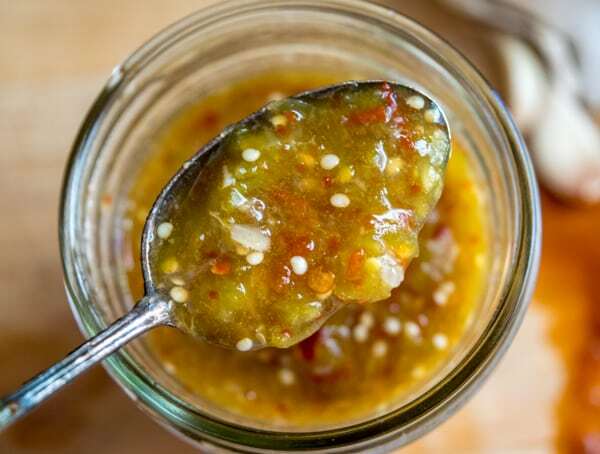 You can use less jalapeno if you want a milder version. 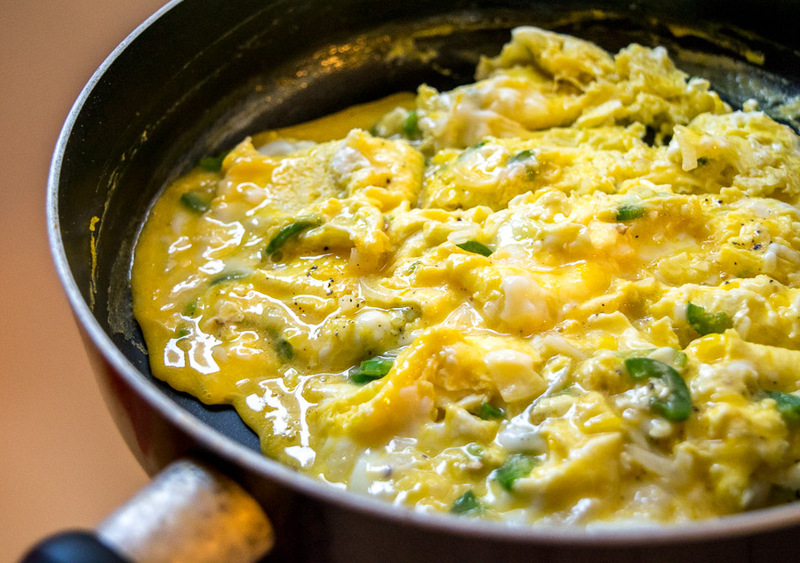 Two eggs per burrito is a good starting point so we’ll add 8 eggs to this onion-jalapeno mixture and cook over medium-low heat until done. Then it’s just a matter of building up your masterpiece as you see fit. I like to heat up the tortillas for 30-60 seconds before building as this will make them easier to roll. Roll tight and give your burrito 1-2 minutes per side in a skillet over medium heat. This will crisp up the tortilla and bring everything inside to a uniform temp. Give these beauties a try, they want to be part of your kitchen arsenal. Got questions? Put them in the comments section below and I’ll get back to you pronto. 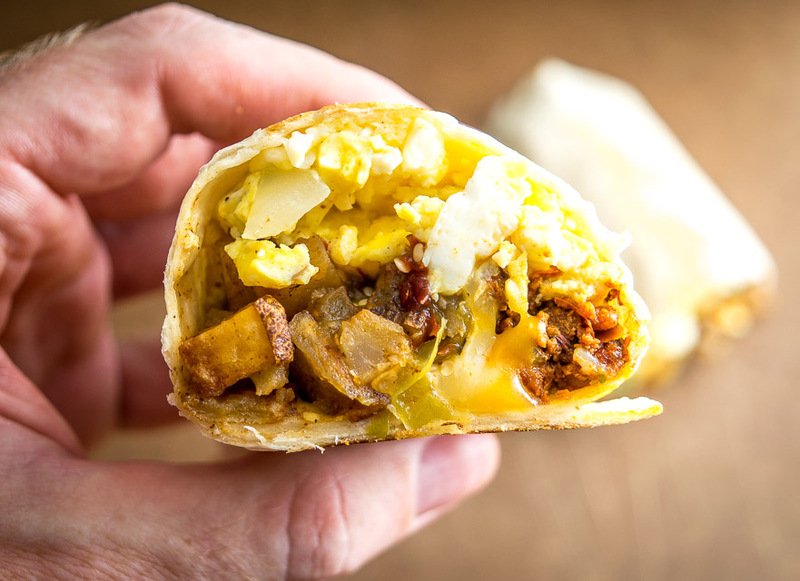 It would be easy to give all the credit to the chorizo in these epic breakfast burritos, but it's the Tomatillo Salsa that really amps them up. So good! Dice a potato and toss with salt, pepper, a dollop of oil, and 1 teaspoon chili powder (optional). Bake the diced potatoes in the oven at 400F for 20-25 minutes, giving them a toss after 15 minutes or so. Husk and rinse the tomatillos. Roast the tomatillos in the oven at 400F for 10-15 minutes or until they start to turn army green. De-stem and de-seed two chipotles in adobo. Add the tomatillos, 2 peeled garlic cloves, and a single chipotle to a blender and pulse blend. Take a taste for heat level. If you want more heat add the second chipotle. If you want a thinner salsa you can add 2-3 Tablespoons of water. Saute the chorizo in a skillet over medium heat for 3-5 minutes on each side. Set aside when done. Finely chop 1/4 onion and 1 jalapeno. 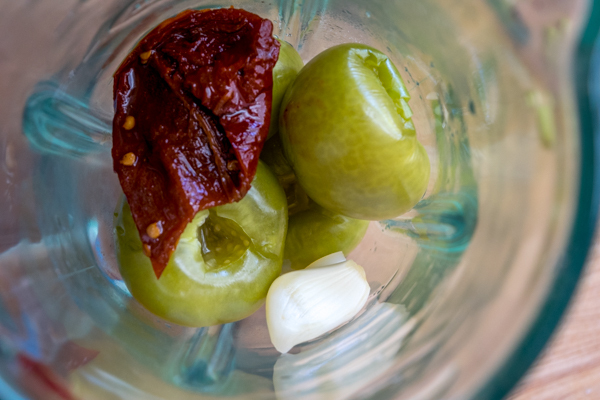 (You can use less jalapeno if you want a milder version). 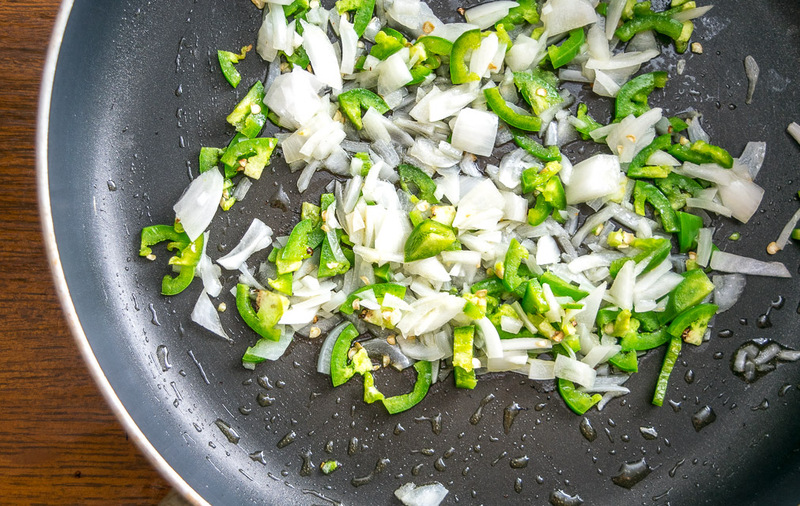 Saute onion and jalapeno in olive oil over medium-low heat for 4-6 minutes or until tender. Whisk together 8 eggs and add them to the onion-jalapeno mixture, along with 1/2 teaspoon of salt and some freshly cracked black pepper, cooking over medium-low heat. Set aside when done. To build the burritos, start by heating up a flour tortilla in a skillet for 30-60 seconds. 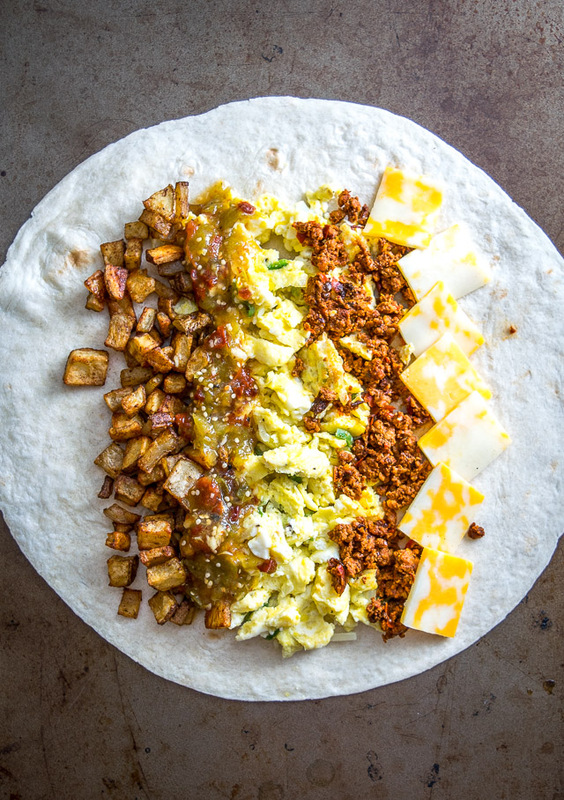 Add the eggs, potatoes, chorizo, cheese, and salsa. Roll tight and saute in a dry skillet for 1-2 minutes on each side or until it crisps up and starts to turn brown. Serve immediately. For speed, I usually add the potatoes, salt, pepper, chili powder and oil to a bowl and cover with plastic wrap. Shake vigorously for 10-15 seconds and the potatoes will be well coated. 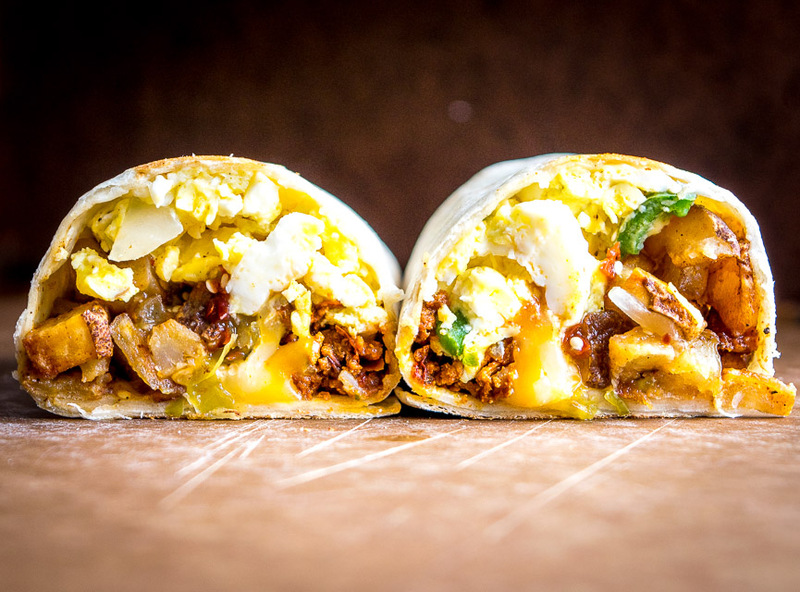 You could use some of our homemade green chorizo in these burritos or even some of our jalapeno hash browns. Got leftover chorizo? 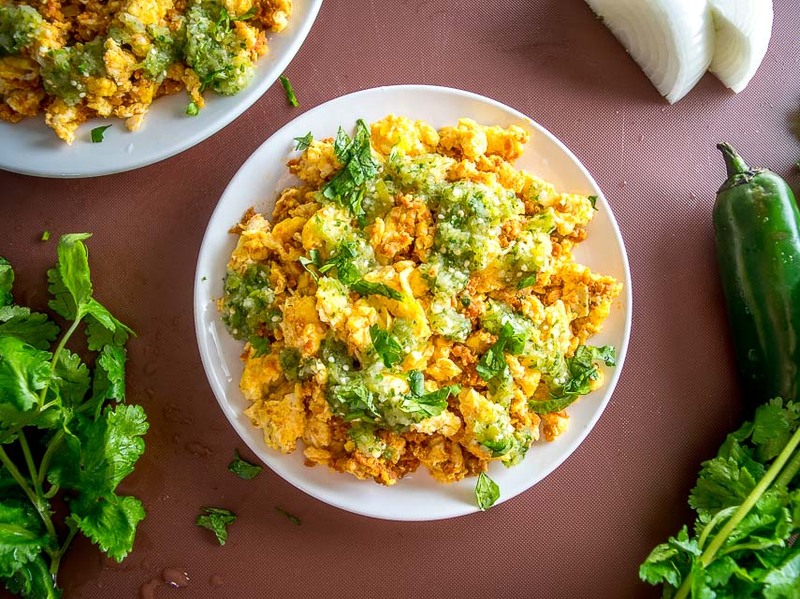 Make some Chorizo and Eggs with Salsa Verde. 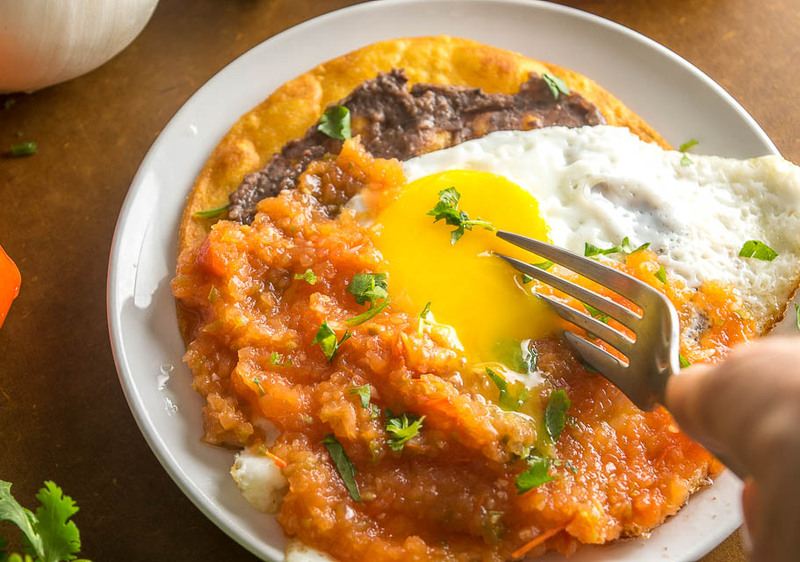 Or maybe some Huevos Rancheros sounds good? Now THIS is a breakfast. I am so in love with this rock star burrito, for real. Cannot wait to try it out! Just made these this morning–love them! Made some with regular hatch green chile and some with your tomatillo-chipotle sauce recipe, and wow. I can say without a shadow of a doubt that these are the best breakfast burritos that I’ve made. Brought them to campus and it satisfied many starving college kids. Awesome, thanks much for your feedback Alicia! I’m glad they are working out for you — I love having that tomatillo-chipotle sauce in burritos! These sound amazing! 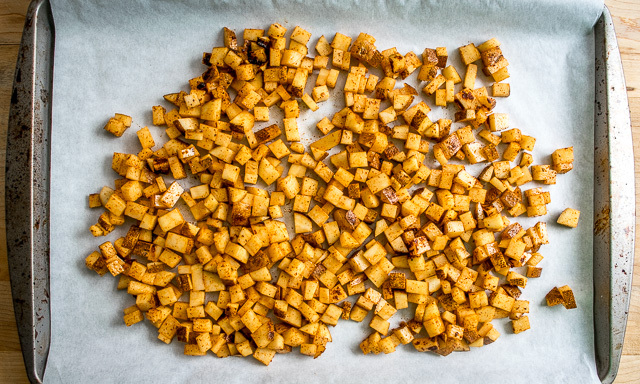 Would you recommend freezing these for an easy grab-and-go microwave breakfast? My husband is always in a hurry in the mornings. Hi Lauren I like how you’re thinking! You could freeze them but I would probably leave out the Salsa before doing so, and just keep some in the fridge and add it in after you re-heat them. I always find bringing Salsa back from the dead a little disappointing. I have been making burritoes in some variation or other for years now. I love the chorizo the best ! I have used eggs, chicken, beef, different cheeses, beans, potatoes, salsa. They are so awesome and you control the sodium. I let them cool and wrap them separately in clear wrap, place in freezer bags and freeze. Great for a meal on the go or at work.